White water rafting is a great way to experience the forces of nature first hand.The thrill and excitement of paddling a raft through white water over fast flowing rapids and close to huge rocks will really get your adrenaline pumping. It's an experience thrill seekers everywhere should try - and is definitely not a sport for the faint-hearted. Anyone from teenagers to pensioners. There are a number of companies who offer a day's rafting for groups and individuals. Equipment is supplied and the cost includes tuition and qualified instructors who will man the rafts. You don't need to have any experience as the instructors will give you instruction and will be on hand to take care of your safety and minimise the risks. A single session normally lasts about two hours. You should take a swimsuit or something similar to wear under your wetsuit. Wear thermals if rafting during the winter or on a cold day. Courage, determination and a fun attitude. White water rafting is an extreme sport and like all other extreme sports there is an element of risk and danger for the participants. Trained instructors will supervise and try and minimise these risks, but there is the possibility that those taking part may end up in cold, fast flowing turbulent water. Safety measures can be taken, but nature is unpredictable and can't be tamed. If you want to participate you should be aware of these dangers and most companies will only allow you to take part if you sign an acknowledgment that you are aware of the risks involved and that you are taking part of your own free will. 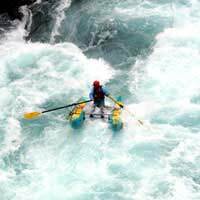 If you are an experienced canoeist or rafter there are still some things you can do to minimise the risks involved. So How Can The Risks Be Minimised? Ensure the proper equipment is provided and you wear it at all times - helmet, wetsuit and life jacket. Make sure the instructor is fully qualified. Wear your lifejacket at all times when in or near the water. Don't go white water rafting alone. If you are going rafting make sure you tell someone where you are going and when you expect to return, and who to call if you don't. Make sure your skill levels match the difficulty of the course and weather conditions. Know how to react to river hazards like holes, boulders and walls. Never run a rapid unless you can see a clear path through it. Be aware of the early signs of dehydration and heat exhaustion in hot conditions. Be prepared for extremely cold conditions. Know the dangers of hypothermia and how to deal with it. Always let the craft in front of you clear rapids before you enter them. Doing so could avoid a double disaster. Rafting in remote rivers should be undertaken with caution. It's important you know that emergency services can gain access to the river along the intended route. If you have an equipment failure or are thrown from the raft it's important that you can reach shore and be able to find a way out to safety. Whether taking part as an individual or as a group, safety is of paramount importance.White water rafting does have its risks, it's the ultimate white knuckle ride, but taking the proper precautions and safety measures will make it an experience you will want to enjoy again and again.